Finally, we reached the “pastry” part of the course. 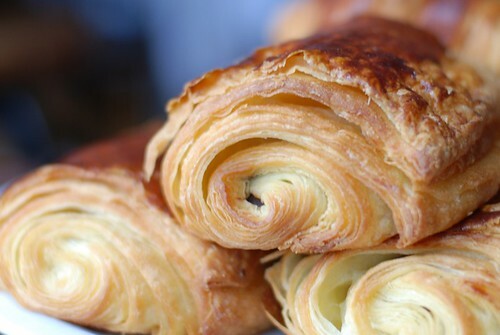 That is to say, “pastry” as it is known to North Americans: pain au chocolat and croissants, the must-have staples if you were expecting French pastries for breakfast. I was so excited for this class, even though we had no break between the demonstration and the practical class for me to digest the information. In general, the method of rolling out the dough is quite similar to what we did for those lovely palmiers, except the dough for croissants had 24 hours to ferment and rise with the addition of yeast. The demonstration chef, my favourite overly angry/nice with a “big mama belly” (he said so himself), made us a bunch of variations on the recipes provided by the school. He is great for demonstrations because he is like that kid who tried really hard to go above and beyond in all of his high school projects – if you needed 3 variations on a theme, he’d do 6. He made us little apricot tarts, raisin danishes (offensive), and best of all – kouign-amann. Kouign-amann (pronounced queen-aman) is a pastry from Brittany that is absolutely to die for. 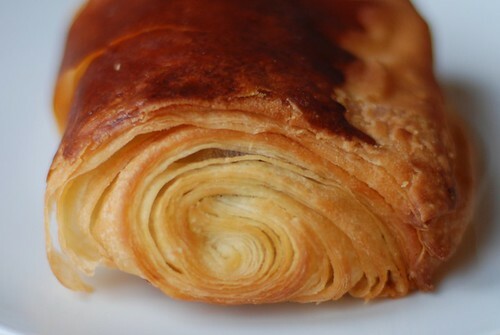 Imagine the croissant dough with flaky layers, sprinkled liberally with sugar between each delicate layer, and caramelized at the edges when it bakes and puffs up. We shamelessly asked the chef for the large squares he cut off for photos, rather than the sample-sized bites he cut up for the class. I ran away with a big slice with the crispiest, loveliest caramelized edge ever, and refused to eat all other samples given out during that class. It was so worth every buttery calorie. Then in the practical, my sugar high quickly deteriorated. Disastrous class #2. The butter chunk that I had to roll into the dough was softened, but not soft enough, and as soon as I began rolling I could feel it. I’m proud that I felt the error right away with my hands, but there was nothing I could do. I asked the chef if there was something that may help, and he said no, if I make a mistake, problème forever. In fact, problème was his favourite word to use. Great…I had an everlasting problem to deal with 5 minutes into the class. After I finished the second turn on the pastry, we were supposed to chill it. I put the dough on the parchment-paper’d sheet pan I had prepared, but it was really warm because I left it by the stove and there was a culinary class before us so the stovetops were still quite hot. I put everything in the fridge, thought about it, and panicked about the warmth and the damage it could do to my dough. So I asked the chef if I could chill my dough in the freezer instead. Obviously he then wanted to feel the dough to see why I would ask that – and he shouted “C’est une catastrophe!” as soon as his hand touched the tray. I’m pretty certain it’s not a French quirk to shout “C’est une catastrophe!” randomly. I was so taken aback and felt myself shrink to pocket-size right away. The chef helped me move my dough into the freezer onto a cooling rack, shaking his head all the while, and I was nervous and jumpy the whole time. After the dough chilled for a few minutes, chef took it out for me and beat it a bit with a rolling pin and refrigerated it for me again in my fridge. By this time I was a messy anxiety-laden wreck, and I tried to gather myself as much as I could when it came time to finish the croissants and pain au chocolat. The rolling took a while because the dough was a little elastic from not resting well, but once I got it to the right shape and size, forming the pastries was easy and fun. First up was the pain au chocolat. It’s a easy enough task to roll it up, but if I were to do it again, I would do it slightly differently. Since I had a couple of visible chunks of butter from the “problème” I created in the beginning, the pain au chocolat I made with that piece of pastry looked completely alien. I ended up with half of my pain au chocolat looking absolutely delicious, and the other half looking rather strange. 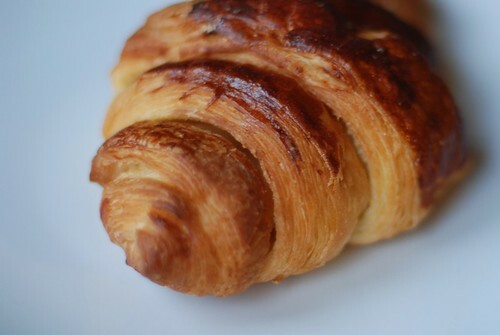 I loved my croissants though – they looked so beautiful when they came out, that my heart gave a little jolt of joy. All was not lost! When the chef came by at the end of class to critique our work, he was really pleased with my pastries. 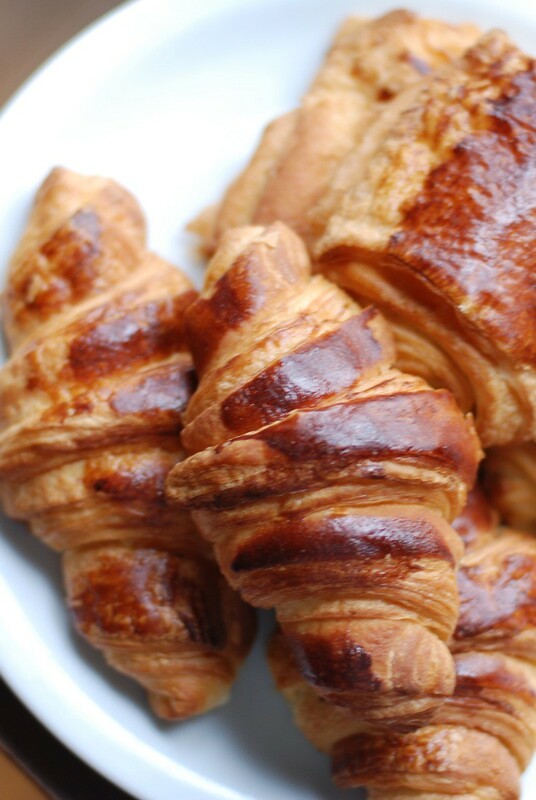 He even used the word “impeccable” to describe the way the croissants were rolled – phew! Disastrous class #2 had an uplifting ending, thank goodness. We spent the rest of the class (at least 45 minutes) kneading brioche dough in preparation for the next class on brioche bread. It was a painfully long process where we started by integrating eggs and flour. When the two ingredients finally combined, we added sugar and salt, kneaded some more, then added yeast, kneaded until the dough became super sticky everywhere, and persevered until it got un-sticky again. THEN we worked in a whole boatload of butter, squishing the fat everywhere, got the dough all sticky and gross again, and finally, almost an hour later, when my dough stopped sticking everywhere and lifted off the marble surface neatly, I was done. Phew! Kneading so much after a long day had a curious effect on everyone, though. As we kneaded people got punchy and lighthearted, and there were a lot more jokes and conversation flowing back and forth between an otherwise serious group of people. Kneading dough definitely relieves stress. I thought it was really nice for everyone to be so cheery at the end of a Friday night, and if kneading does this to people, then perhaps we should’ve started the session on breads because it is such a good icebreaker! It also helped that while we kneaded, we enjoyed the awesome smells of freshly baked croissants and pain au chocolat. Yum! Wow! Those look absolutely delicious! I hope you know I’m vicariously living through your blog wishing I was in Paris right now! Thanks Anita! I only hope when I try to replicate these things in Canada that they will work out again!